When holding this unit, keep your elbows close to your sides to prevent camera shake. Be careful not to drop this unit during transportation. Guardians should pay close attention when this unit is used by children. 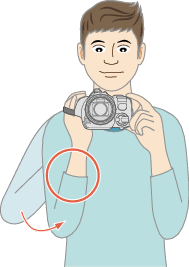 If camera shake is excessive, use the image stabilizer.